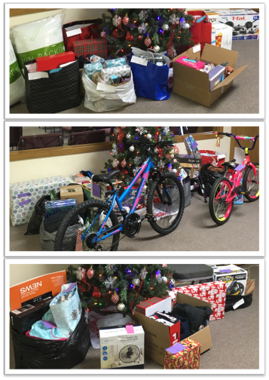 We came together to provide a Merry Christmas for some local families by fulfilling their Christmas wish lists. Thank you to all who participated in this ministry! ​The Orchard contributes to the Needs Pantry at The Rock of Kingsley. Items we collect and contribute change each month. PLEASE HELP US support spreading the Gospel through PRAYER! The Orchard Church supports worldwide missions by praying, giving, going, and sending. We strive to encourage and support these missionaries who obeyed The Lord's call to share the Gospel in a wide variety of areas--from places where there is open acceptance of God's Word to places where evangelism is viewed with hostility and antagonism. ALL OF THESE MISSIONARIES NEED AND APPRECIATE PRAYER. Please join us in praying for those serving on the mission on field. This was our 7th year offering this ministry in partnership with Auto Tech of Kingsley. We provided free oil changes, car inspections, auto interior vacuuming, refreshments, and free winter apparel for 29 single parent familes. Thank you to everyone who joined us for GAME ON! It was a wonderful week of fun, activity, and friends learning to gear up for Life's Big Game! The Orchard participated in the Saturday parade and handed out bottled water. We served up snow cones and popcorn at the softball tournament and helped at the Children's Games from Noon to 6pm. ​We worshipped with other local churches in Brownson Memorial Park on Sunday morning. ​We're grateful to God for placing us in this wonderful community. ​June 2018: Pastor Nathan was in Vietnam for 3 weeks to mentor and equip Vietnamese Christian leaders to be effective biblical teachers in their rapidly growing churches. ​May 2018: The Orchard reached out to a local family to help with home repairs. We accomplished a lot! Thank you to all who pitched in that day! Feb. 2018: The Missions Team partnered with Freedom Builders on Feb. 24 to build a wheelchair ramp for one of our neighbors. ​December 2017 - ​Adopt a Family Outreach. October 2017 - Annual Car Care Clinic for single parents: free oil change, vehicle inspection, and interior vacuuming/cleaning for 22 single parents, plus free winterwear givaway. August 2017 - The Orchard sent a team to Sault Ste. Marie Michigan to share the Gospel and hand out backpacks filled with school supplies. June 2017 - Pastor Nathan and his Crosstalk Global team coached pastors in Vietnam to more effectively preach and teach the word of God. The Orchard hosted children ages 1st - 6th grade who learned about missions and sharing the Gospel. They baked bread for local fire/rescue workers. The Orchard helped local families have a Merry Christmas by giving them gifts from their wish lists. We went out into the community to hand out Thanksgiving gift certificates and share the gospel of Jesus Christ door-to-door. The doors of the church were opened for a simulcast viewing of The Insanity of God. 5th Annual Single Parents Car Care Clinic and Winter Outerwear Giveaway: The Orchard and Auto Tech of Kingsley partnered to give free oil changes, vehicle inspections, and winter outerwear to 29 single parent families. Prayer Walk, Block Party, concert, and backpack/school supplies giveaway. We plan to continue this type of ministry in other places. Watch for more information. Orchard members worked with Freedom Builders and other churches to help local families with urgent home repairs. The Orchard kitchen was home base for the lunch prep crew. We helped Freedom Builders prepare & deliver lunches daily to workers on site. We ended Freedom Builders Week by hosting the Celebration Service on July 23. Pastor Nathan traveled to Vietnam and spent 3 weeks working with pastors there to help them develop more effective preaching. ​Many Orchard members collected donations for the Annual Baby Bottle Boomerang to support the Pregnancy Care Center of Traverse City. June 3-4 - Prayer Walk at Sault Ste. Marie Reservation. The Orchard gave out carnations purchased from the Pregnancy Care Center of Traverse City to support their services to women in the area. Traverse Heights Elementary - Orchard members and Traverse Heights parents prayed together while walking the Traverse Heights neighborhood. Later that week Orchard members worked at the Traverse Heights Carnival, bringing cotton candy, popcorn, snow cones, the bounce house, and the big slide. at Bambi Lake Retreat and Conference Center. We learned to use the tool "3 CIRCLES: LIFE CONVERSATION" and received training to help us be more effective when serving The Lord and our neighbors. January 2016 - The Orchard opened her doors to the community for a free screening of Up and Toy Story. ​January 9, 2016: The Orchard partnered with Freedom Builders to provide a home wheelchair ramp for a local family. ​The Orchard fulfilled ​Christmas wish lists for some local families. October 2015 - 4th Annual Single Parents Car Care Clinic and Winter Outerwear Giveaway: The Orchard and Auto Tech of TC partnered to give free oil changes, vehicle inspections, and winter outerwear to 36 single parent families. The Orchard opened its doors four Fridays to host free viewings of Cars, Frozen, The Prince of Egypt, and The Chronicles of Narnia. Southern Baptist Disaster Relief was housed at The Orchard Church to help remove trees after the tornado in Glen Arbor. The North West Baptist Association of churches also helped provide meals for the team. We partnered with Freedom Builders and area churches to help our neighbors repair their homes. We also hosted a celebration Saturday evening! June 2015 - The Orchard Church sent Pastor Nathan's to Vietnam with Cross Talk Global to help train local pastors. ﻿May 2015 - We partnered with Traverse Heights Elementary PTO to help put on a fantastic school carnival. Many Orchard members worked at various stations or donated baked goods. The Orchard Church family worked with local schools and agencies to provide Christmas gifts for several area families. October 2014 -3rd Annual Car Care Clinic for Single Parents: Free oil change, car inspection and interior vacuuming, and children's winter apparel giveaway. In partnership with AutoTech of TC. The Orchard Church family worked with local schools and foster care agencies to provide Christmas gifts for several area families. Fall 2013 - partnered with Auto-Tech for our 2nd annual Free Oil Change for single parents.. The Orchard Church raked lawns of local families in need of this help. August 17 and 22, 2013 - hosted two back to school clothing giveaways. Everyone went away with bags of clothes! We also gave away even more clothing at the Oil Change Event September 28 and October 12! July 9-13 2013 - The Orchard Church partnered with Freedom Builders and area churches to serve our neighbor's physical and spiritual needs. June 2013 - We hosted an "Athens" Vacation Bible School at our facilities! May 2013 - The Orchard Church partnered under Freedom Builders to help put a roof on a neighbor's home. April 2013 - Six children were sponsored in an ongoing capacity through Compassion International at the Orchard Church. December 2012 - gathered and delivered presents to fulfill Christmas wish lists for three local families. November 2012 - The Orchard Church raked leaves for neighbors in need. October 2012 - The Orchard partnered with Auto-Tech for two weekends to offer single parents a free oil change, and hold an outdoor children’s winter apparel giveaway. We helped 40+ individuals. June 2012 - The Orchard Church and Bay Pointe Commuity Church partnered with Freedom Builders to paint homes, build roofs and share the love of Jesus with our neighbors. May 2012 - our first team-up with Freedom Builders to help begin the conversion of a garage into a room! December 2012 - teamed up with a local school and Bethany Adoption Services to provide Christmas presents for our neighbors. Summer 2011 - hosted free Vacation Bible School for our neighbors. August 2010 - missions trip to Cairo, IL to help renovate plumbing, flooring and homes. Summer 2010 - hosted a free VBS for our neighbors. 2009 - prayer walk and assist SBC church plant in inner city Grand Rapids. Summer 2009 - Trip to Mound City, IL. to paint and re-roof a house, clear yards of storm debris, and help host VBS at First Missionary Baptist Church, Mound City. 2009-2010 - hosting some church services at Birchwood nursing home. 2008 - outreach ministry to Tendercare nursing home. 2006 - The Orchard Church helped build the bunk beds for the Goodwill Inn.